Last timeI gave a brief (?) run through the various types of metabolic rates that we find in the animal kingdom, along with the various ways in which they were measured. There was one last metabolic rate type I wanted to cover, but instead only teased; that of mass specific metabolic rate (MSMR). This type of metabolic rate measurement is fundamentally different from all the others that we talked about previously, and coupled with the sordid history behind this concept, it seemed appropriate to give MSMR its own post. So without further ado, let’s get this party started. Dinosaur fanatics will no doubt recognize this infamous phrase. It tends to pop up a lot in literature dealing with dinosaur energetics. Mass specific metabolic rate differs from other MR measurements because it is not an actual measurement. Rather, MSMR is a mathematical abstraction taken from actual metabolic rate measurements of multiple taxa spanning a wide range of sizes. Ultimately what MSMR does is show us how metabolism scales with size. That in itself deserves a brief digression. Size can radically change an organism’s structure, and function. The reasons for this relate back to some fundamental physical properties of all things. For instance, consider the metrics of height, width and length. Each of these measurements, taken by themselves, represent one dimension only. If one wants to get the idea of the size of a two dimensional object, one need only combine (multiply) any two of these measurements. If we combine all three we can get a good 3-D representation of how much space an object takes up. If any structure is to grow isometrically (i.e. everything grows at the same rate) then for any increase in a linear measurement (length, width, or height) the area of that object will double, while the volume of the object will triple. 2m x 2m = 2m2, or 4 meters in area (4 square meters). While the object doubled its length, it quadrupled its area. 2m x 2m x 2m, = 2m3, or 8 meters in volume/mass (8 cubic meters). So now the object that has increased its linear measurements by 2, increased its surface area by 4 and increased its mass by 8. This has immediate implications for any organism. If we look at just vertebrates we find that the strength of things such as bone and muscle are determined by their cross sectional area. To put this in more practical terms: for any given change in length, width or height of an isometrically growing organism, strength is going to double while weight is going to triple. The obvious problem here being that eventually (and rather quickly) weight is going to outpace strength. 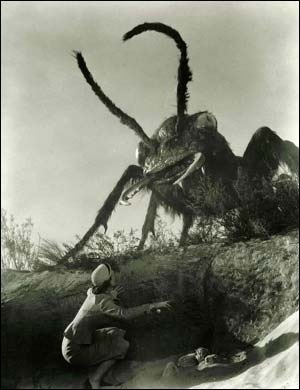 This puts a limit on how big an organism can get. It also explains why the short guy in gym class can always do more chin ups than the taller guys. Where a is an experimentally determined allometric coefficient, Mb is body mass, and b is the allometric exponent. For the purposes of this discussion the general rule is that bigger vertebrates will have relatively bigger bones and muscles than a smaller vertebrates scaled up to their size. Rubner, Kleiber and metabolic scaling: battle of the Maxes. If bigger creatures generally show an allometric increase in size for various body parts, then one would expect to find some kind of similar allometric effect for metabolism. After all, a bigger animal is going to be composed of more cells, which will require more energy to power. So then should we expect metabolic rate to scale to mass (i.e. to increase by the third power?). Perhaps, but one should also keep in mind that as each of these cells expends energy, they are also producing a little bit of heat. Thus more cells results in a hotter critter. In animals, heat is lost primarily via conduction; a process that is intimately associated with surface area. Perhaps, then, it would be better if metabolic rate followed surface area instead, and increased by the second power. However which way metabolism scales it looks like it should relate somehow to these two variables. In order to figure this out, one must measure the lowest metabolic rate of one’s animals — the BMR/SMR. The reason for using BMR/SMR is that one is theoretically looking at the “metabolic floor.,” or the MR level that must be maintained to avoid death (and, thus the MR that is not likely to be affected by food acquisition, exercise, stress, etc.). The importance of using BMR will come up again further down. One measures the BMR/SMR of one’s animals and plots those metabolic rates against the size of the animals measured. From this one should be able to acquire a ratio of metabolic rate to mass. Often the data must be regressed first in order to achieve any kind of statistical analysis. The first attempts at this were done using mammals, and one of the most influential people to try this out was Max Rubner. Rubner measured the metabolic rate of dogs and regressed these data against mass. What he found was that as body size increased, metabolic rate increased by approximately 2.325 times. Rubner took this one step further and found that his exponent for metabolic rate could be made mass independent by simply subtracting it from the exponent for mass (3.0). The end result: mass specific metabolic rate for dogs appeared to increase by the 0.675 power, or the 2/3rds power (Rubner 1883). So what does all of this mean? Essentially it means that metabolism increases slower than body mass. 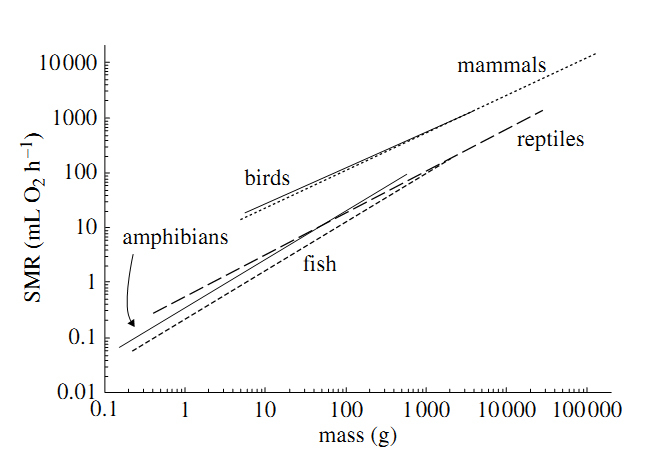 So if we were to graph out metabolism in relation to the amount of mass that that metabolism is powering, we would discover that the data form a negative slope, with bigger animals falling further towards the low end of the slope than smaller animals. To put it more succinctly, it takes less relative metabolic energy to power a larger mass than it does to power a smaller mass. This is mass specific metabolism. *The 89kcal/day/kg is the allometric constant given by Rubner 1883. It is the average BMR for his dogs after correcting for mass. A visual example for the scaling of metabolic rate. What we find is that the boxer does have a higher metabolic rate than the beagle, but it is only 1.67 times greater, instead of 2. This lower than expected metabolic rate will translate to lower than expected food costs as well. To put it another way: it would be cheaper to feed one boxer than to feed two beagles of roughly the same size, or to shift things away from dogs: it is cheaper to feed one elephant than it is to feed an elephant’s weight in shrews. Quarter power laws for everyone. So Rubner’s law was broken, and Kleiber’s law came in to replace it. For over 70 years Kleiber’s law was held up as that rare case of a biological constant Subsequent BMR studies of mammals (Brody 1945) and other organisms including bacteria (Hemmingsen 1960) found results that “hovered” around 0.75, thus suggesting that this biological law was not just a mammal thing, but rather a hallmark of all organisms. This leads us to the obvious question of why? Typically, the response to this question is a thermal one. Small animals lose heat easier than large animals, due to their larger relative surface area. If a large animal has an easier time retaining body heat, then it would make sense that its body would need to produce relatively less of it. The problem with this answer is that it only works for automatic endotherms (i.e. mammals and birds). However the MSMR phenomenon is present in bradymetabolic thermoconformers too. Therefore this answer cannot be the only one. The answer to this question had remained elusive up until 14 years ago, when West et al proposed that the quarter power scaling laws that we see in nature appear to be the result of the fractal nature of delivery networks (West et al 1997), which in the case of vertebrates, are blood vessels. West et al. proposed that the fractal nature of blood vessels, combined with area preserving branching patterns could be used to explain why metabolism scales to the 3/4 power. The work by West et al was the first real attempt to explain why metabolism should scale to the 3/4 power, and has since been referred to as the metabolic theory of ecology. Data on MSMR calculations from Brody and Hemmingsen all seemed to show that everything followed the 3/4 exponent rule. These two papers, along with Kleiber’s influential work, are some of the most cited papers in the physiological literature. One the one hand this illustrates just how influential their findings were for biology in general, but on the other hand it also suggests that their work should be the most thoroughly scrutinized. Scientists occasionally take the work of others for granted. This can lead to unpleasant side effects and near dogmatic views of things (e.g. the old saw about swamp bound dinosaurs). In general, it is a good idea to occasionally go back to these seminal works and verify that the authors got things right the first time. Dodds et al. (2001) did just that. The authors looked back at the work of Brody, Hemmingsen, Keliber and others in the field of MSMR, in order to see if the 3/4 power law was a real thing, or mathematical error. Their results found that data from as far back as 1982 suggested that there was a problem with the 3/4 power law. Much of the data that had come out since Kleiber, Brody and Hemmingsen’s time suggested that the exponent for metabolic power should lie much closer to 2/3rds than 3/4. Dodds et al. went even further and challenged the metabolic theory of ecology by citing apparent mathematical errors in the work by West et al. in 1997. This challenge to the model by West et al. remains controversial, with arguments that continue to sling back and forth (e.g. Kozlowski and Konarzewski 2004, Brown et al 2005). Dodds et al (2010) recently took on the nutrient supply approach spearheaded by West et al, but looked at it from a purely geometric point of view (rather than fractal.). Their results found strong support for nutrient networks being the limiting factor for metabolic rate. Their results also found that these structures scaled to the 2/3rd power. Kleiber’s faux pas; or: why MR type matters. In 2003, White and Seymour gave a critical re-evaluation of Kleiber’s initial work. Kleiber was an agriculturist, and at least part of his impetus for looking at MSMR was to produce a greater yield in biomass, for farm animals. It is no surprise, then, that most of Kleiber’s study animals were of the barnyard variety. The problem with using livestock to determine MSMR is that domestic animals — especially ones that are raised for food — have been under extensive selection to produce larger animals for less cost. Thus, they are unlikely to be accurate representatives of a “wildtype” metabolic rate. Another, much larger, problem was the over-representation of artiodactyls in Kleiber’s study. In fact, both Kleiber, and Brody (and by extension Hemmingsen, as he re-used most of Brody’s data) had artiodactyls encompassing over 20% of their data. Okay, so what exactly is the problem here? The problem is that artiodactyls only make up approximately 5% of all extant mammals. To increase this representation by 4 times is going to skew the results. Also, as White and Seymour pointed out (2003), many of these animals were on the upper edge of the regression line, resulting in a disproportionate influence over the scaling exponent. Topping it all off was the biggest issue of all, and one that crops up time and time again with many metabolic studies. As mentioned in part 1 of this series, BMR and RMR are not the same thing. If one is going to measure the mass specific metabolism of an animal, one must get it from the basal metabolic rate. There are strict methods for acquiring these data (McNab 1997), not the least of which is the necessity of measuring the metabolism of an animal that is in a post-absorptive state. This is a time in between eating and fasting, where the body is not doing any digestion at all. This is important because digestion can actually ramp up basal/standard metabolism substantially over resting/fasting levels. Perhaps the most dramatic example of this would be data from Burmese pythons (Python molurus) in which feeding metabolism increases SMR by over 44 times the resting rate (Secor and Diamond 1996)! Ensuring that an animal is in a postabsorptive state is no easy task. Some taxa, such as very small mammals (e.g. shrews, hamsters, etc) run so close to the thermal edge that it might be impossible to get them in a postabsorptive state without killing them. As Speakman et al (1993) wittingly put it: “Before small shrews become post-absorptive they enter a state of profound rest in which they have zero metabolism and from which they never recover!” One might wonder, then, if BMR = RMR in such a situation (but see McNab 1997 for a counterpoint). The problem with artiodactlys is that they are ruminants. 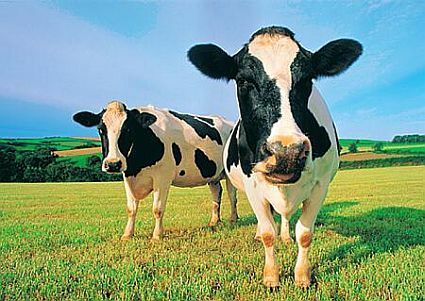 That is to say they rely on bacterial degradation of cellulose in order to extract nutrients from their food. Because of this, the digestive phase for ruminants can last for a substantially long time. Typically, artiodactyls are fasted for 72 hours before having their BMR measured, yet data on digestion in ruminants suggests that they can last as long as 7 days before entering a postabsorptive state (White and Seymour 2005), if at all (McNab 1997). When this is not taken into account, one winds up measuring RMR instead of BMR, which raises the overall exponent to the mass specific metabolic rate equation. Now, to be fair, Kleiber did note that his extensive use of artiodactyls (three cows and a sheep) could have an unwanted effect on his data if they were not being measured in a postabsorptive state. Thus, he performed an analysis with and without his ruminants. Interestingly, the results still hovered around 3/4ths (0.72-0.73). White and Seymour (2005) argued that the reason behind this still high exponent might be due to the relatively high BMRs of domestic carnivores (Kleiber used dogs) and humans. The authors later went on to show that the removal of these data points ultimately drops the exponent down to the 2/3rds that seem to be so commonplace among other metabolic studies. Another aspect of BMR studies that tends to get overlooked when researchers attempt MSMR calculations is the need to measure animals in a thermoneutral environment. This is an environment in which the animal is not actively thermoregulating, otherwise known as the thermoneutral zone. Automatic endotherms are often lauded for their ability to maintain body temperatures regardless of the external environment. This seems to have lead to the assumption that the environmental temperature should not matter, which results in experiments that grab metabolic rate data from animals that are in fact, rather stressed (e.g. Hanski 1984, who measured “BMR” in shrews that were 7°C below their thermal neutral zone). White and Seymour noted that mass and body temperature showed an intimate relationship in mammals (White and Seymour 2003), and that in order to get a useful comparative estimate of BMR for mammals that encompasses the full range of masses seen in this group, BMR should be standardized to a common body temperature. This is very intriguing for White and Seymour have essentially taken BMR and converted it to SMR. As mentioned previously, automatic endotherms do not escape the Q10 effect, but instead keep it at bay by keeping their cells encased in a bubble of stable temperatures. This means that one can use Q10 values to adjust BMR to fit an appropriate “universal” temperature with which to compare taxa. That temperature turned out to be 36.2°C with a Q10 of 3.0. White and Seymour discovered that when BMR was standardized to a universally comparable temperature, the mass specific exponent for metabolic rate was approximately 0.67, or 2/3rds. Even more fascinating: when data for birds are given the same rigorous treatment, they also scale to the 2/3rds power (McKechnie and Wolf 2004). So it appears that Rubner had it right all along. For seventy years we have been using a formula that suffered from some hefty methodological errors. Well at least that’s all fixed now, right? One power law to rule them all? Probably not. Dodds, Rothman, Weitz (2001), White and Seymour’s (2003) works to turn over the established 3/4 power law belief in physiology did not go unquestioned Savage et al (2004) gave a particularly in depth critique of their analyses, pointing out some questionable assumptions that White and Seymour had made, as well as the disproportionate amount of data available for mammals (i.e. some genera were over-represented with multiple BMR measurements, while others might not have any data at all). This violates a fundamental assumption of practically every statistical analysis. Namely that data points are independent. 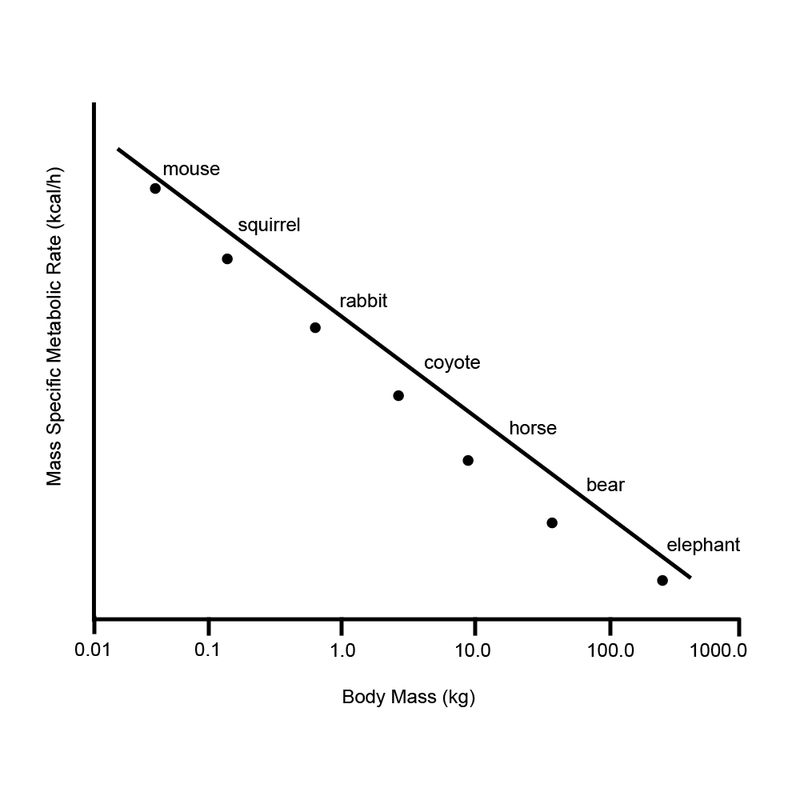 Savage et al pointed out that most BMR data exists for mammals that are less than 1kg in size. This is going to bias the regression statistic (indeed, Dodds et al. noted that the 2/3rd power only seemed effective for mammals up to about 10kg. The authors cited a lack of data for larger taxa as a likely cause of this strangeness). Savage et al decided to repeat the statistical analyses of White and Seymour, as well as a few other authors. In the process they found various errors in each analysis that resulted in some major discrepancies (e.g. 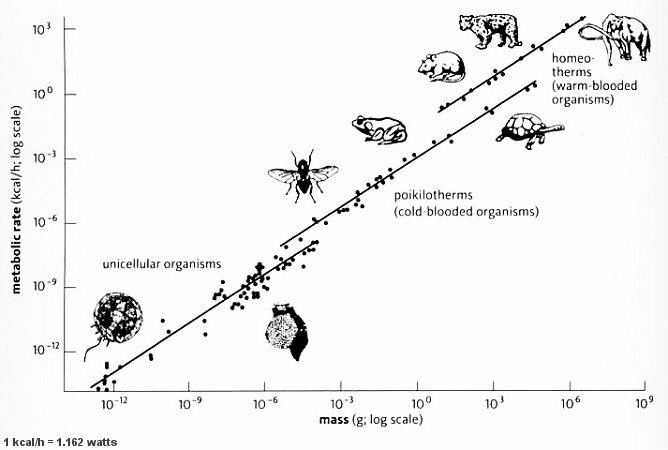 basal metabolic rates that varied over an order of magnitude for the same species in the same study, the exclusion of large chunks of Mammalia that spanned the larger size ranges, thus reducing their dataset). The authors separated their taxa into “bins” that covered various size ranges. The idea being that by separating mass into sections like this, they could turn mass into a treatment effect, which should allow the statistical analysis to better analyze the effect of BMR as described by body mass. The result of Savage et al’s study showed that the scaling exponent for BMR to body mass was around 0.712 +/- 0.012. This new regression suggested that the “true” exponent for BMR in relation to mass, was neither 2/3rds, nor 3/4ths, but something in between. The authors noted this unexpected result, but quickly pointed out that this was for data that was heavily biased for small size (mostly rodents). This was where the “binning” idea would come into effect. By essentially forcing a uniform distribution across the mass ranges available the authors results revealed an exponent of 0.737 +/- 0.025, or an exponent that lives around 3/4ths. The authors took this a step further by looking for exponents to describe field metabolic rate and maximal metabolic rate. Their reasoning being that these are more easily obtained measurements that have more biologically meaningful results to them. I am less confident of these results, as FMR encompasses many aspects of an organism’s lifestyle, while MMR can be difficult to fully obtain. Further, I would argue that the benefits of BMR is that they indicate what the bare minimum energy requirements of an organism should be. That has the potential to be extremely useful for paleontology. Especially if one is looking to figure out how much food (at minimum) an organism would need to eat to survive in some environment (and thus, infer something about thermophysiology). White et al . (2006) responded back, by doing a more thorough analysis of available data. They disregarded Savage et al’s notion of mass “binning” (which was fine, as Savage et al. disregarded the need to adjust for temperature, citing negligibility of the results as the reason), and used data from 938 species ranging from 158mg (0.35 lbs) to 138kg (304 lbs), and covering every major vertebrate class. Data were only used if they fit the strict criteria for BMR mentioned previously, and each group was compared to a standard temperature (38°C and 20°C), after accounting for Q10 effects. Once again, White and Seymour found strong support for a 2/3rds exponent…for mammals and birds. Figure 1 from White et al 2006 illustrates the mess likely represents a more accurate look of how metabolism scales with mass. Note how the automatic endotherms actually scale up slower than everyone else. Then, after assigning some fancy statistical mojo (weighted generalized mix model, for those that are into that kind of stuff), the authors found that among their three categories, only thermoregulation seemed to show any real affect on where the exponent wanted to go (i.e. it “pushed” the exponent towards some kind of “true mean”). This suggests that a true discrepancy between these modes of thermophysiology ultimately affect metabolic rate. Surprisingly, White et al’s study seemed to show that automatic endotherms converge at an exponent closer to 2/3rds, while everyone else hovers closer to 3/4ths. However there is still considerable sway around these exponents. So much so that White et al. urge researchers to do away with the 2/3rds 3/4ths argument altogether, as it has become quite apparent that choosing one, or the other is going to both bias results and obscure pertinent data. The authors do offer some alternatives that might be used such as statistics that incorporate multiple exponent models, accounting for body mass by using it as a variable in an analysis of covariance (ANCOVA) model, or just choosing the right exponent for the job (e.g. the 3/4ths exponent seems to work well for FMR of mammals, but overestimates the FMR of birds). So here we are, finally at the end of this long winded blog entry, and what do we have to show for it? Well…mostly that biological laws are so few and far between that any relationship, or phenomenon that has the audacity to be referred to as a “law” or “rule” should probably be taken with a grain of salt. Another thing to take away from this is just how complicated metabolic physiology studies really are. They have to account for so many unexpected variables that is amazing we can say anything at all about extant animals. One thing I did not touch upon was the fact that all MSMR equations use regression as their model of choice. A severe limit to this approach (and one that is violated all the time) is that regression models can really only predict — with any certainty — the estimated MSMR of an animal that falls within the size range measured. Once one starts to extrapolate beyond the maximum, or minimum size of the available data, one is practically just speculating. 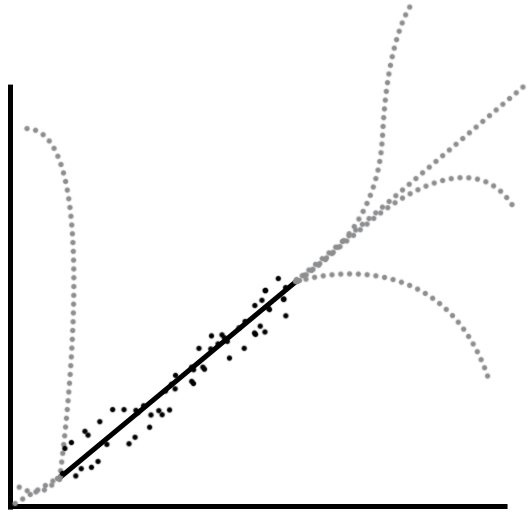 Regression graph showing trend line for a range of predicted values (bold line) and possible real distributions that exist beyond the measured data (grey dotted lines). Hence why regression predictions should always be limited to the range of data used. Lastly, given what little we are able to say about extant animal metabolism and its limits, just think about how much less we can confidently say about extinct taxa. This is especially true for paleontological studies that attempt to use metabolic scaling exponents to infer the possible thermophysiology of extinct organisms. Thus any study that attempts to do this kind of paleophysiology, would be best served by computing hypothetical BMR/SMRs that used a wide range of metabolic exponents. And that, in a nutshell, is what all the fuss is about for MSMR. Brody, S. 1945. Bioenergetics and Growth. New York: Reinhold Publishing Corporation. Frappell, P. 2006. Respirometry, The Gold Standard. The Physiologist. Vol.49; 12. Savage, V.M., Deeds, E.J., Fontana, W. 2008. Sizing up Allometric Scaling Theory. PLoS Comput.Biol.Vol.4(9):e1000171. Schmidt-Neilsen, K. 1984. Scaling: Why is Animal Size so Important? U.K.: Cambridge University Press. Metabolism, and metabolic rate tend to feature pretty highly in literature related to dinosaurs and other reptiles. For instance it is often stated that reptiles have metabolic rates around 1/10th those of similar sized mammals and birds, but what exactly does that mean? Talks of thermoregulation focus heavily on the role of metabolism, while allometric studies focus on how metabolism is affected by size. Given the prevalence of metabolic terminology in dinosaur and reptile papers/books, I thought it might be best to quickly give a review of metabolism, metabolic studies, and what all of that means for real animals. Metabolism is defined as the sum total energy expenditure of an organism. That is to say metabolism is the total energy an organism uses during its life. It is often broken up into the chemical reactions that build up resources (anabolism) and the reactions that break those resources down (catabolism).� The amount of metabolism, or energy expenditure during a specific interval of time (seconds to days) is referred to as metabolic rate. From bacteria to blue whales, metabolism is the measure of all the energy that lets these critters go, and metabolic rates determine how much energy that is going to take. It can be measured in a variety of ways from respirometry to doubly labeled water and heart rate telemetry. The diversity of metabolic rate measurements is reflected in the units used to measure metabolism; which can range from watts/hour to milliliters of oxygen per minute, and even to joules per second. A key thing about metabolic rates is that they are plastic. They change depending on the situation presented. For instance one could measure the metabolic rate of a sleeping cat, and then compare it to measurements from that same cat while playing, or after eating a big meal. Metabolic rates ramp up when energy demand increases, and then ramp down when that energy demand decreases, or when the environment demands drastic energy cuts (e.g. starvation). Thus when measuring the metabolic rate of an animal it is important to decide exactly what kind of metabolic rate you are trying to measure. And boy, oh boy are there a lot of different flavours to choose from. One can measure: BMR, SMR, RMR, MMR, AMR, and FMR just for starters. Those are a lot of initialisms, and they are just the most common ones. The choice of metabolic rate that one decides to measure is also going to dictate the technique that will be employed. So what do all these things stand for, and what technique is best for what? Let’s find out.